Rauris is a market town in the Pinzgau area of Salzburg. It has a total population of approximately 3,000 and is known for excellent hiking opportunities. As usual in sparsely populated areas, the territory of the municipality is rather large - Rauris is the biggest community of Salzburg in terms of land. It includes most of the Raurisertal valley, once an important mining centre and origin of highly valuable gold ore. Rauris lies within the National Park Hohe Tauern. Today, Rauris is a bi-seasonal holiday destination that sells some 420,000 over-night arrangements per year. 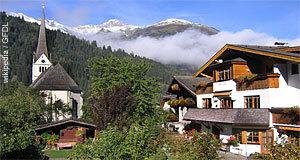 The local skiing area Rauriser Hochalmbahnen extends between altitudes of 950 and 2,200 metres. Its slopes sum up to some 25 kilometres, not overly much by Pinzgau standards. However, Rauris makes a good base for exploring other skiing areas in the wider region. Historically, the Raurisertal has been populated for a very long time. Archaeological finds allow to provide evidence for settlers in the valley ever since Neolithic times. The current Rauris was first mentioned in a written document dating back to 1120. In the Middle Ages, the gold mining in Rauris became an important aspect of the local economy. In addition, medieval Rauris was an important hub for the trade routes (via primitive paths, so-called Saumpfade) between Central Europe and Italy. The Rauriser Tauernhaus, an inn and shelter, was recorded as early as 1491 - the building is still preserved today as one of very few surviving Tauernhäuser. A church had already been built in Rauris in 1354. The mining in Rauris saw its peak in the 15th and 16th century. Around 1500, Rauris has as many residents as today - several houses from this time illustrate the wealth that was present in the town back then. In 1636, the Prince Archbishop seized direct control over gold mining. After the secularisation of Salzburg, the mining declined rapidly. Only in the later 19th century, the mining had a short renaissance, triggered by an entrepreneur who also built the first meteorological observatory on the summit of Mount Sonnblick in 1886. The Sonnblick is still home to Austria′s best-equipped Alpine research facility of meteorology. Gold mining finally ended in Rauris in the early 20th century and plans by the Nazis to start the business again after the Anschluss in 1938 failed. Recent attempts to start gold mining again were rejected by the administration and population in the region for environmental considerations and because of tourism.